I like the nut and seed chart you created. I am wanting to know based on the nutritional info about each variety what portion size are they all based on in grams? Usually I’m pretty good about letting folks know where I find things like the nuts and seeds chart but unfortunately I didn’t reference it on this one chart. 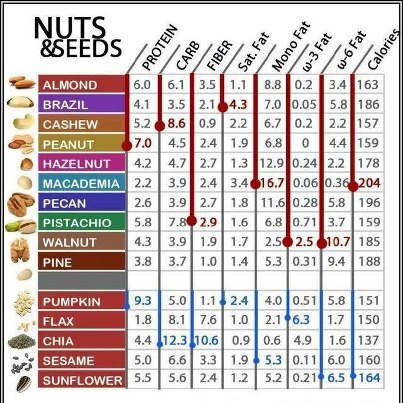 🙁 However I did find a really thorough list on this site http://www.health-alternatives.com/nut-seed-nutrition-chart.html I hope this is helpful.